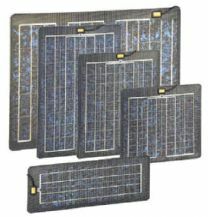 The Solara M-series panels are of German manufacture and have a proven pedigree. The unique dimpled surface offers the dual benefits of a "prismatic effect" refracting the light from all different angles onto the cells and also acts as a non-slip surface. Solara panels are extremely strong and robust for use in harsh environments. An alternative to oversized, rigid or inflexible glass panels, made of stainless steel they are smaller, lighter, and extremely thin. They can be glued or screwed to virtually any surface and thanks to their thin structure can be shaped to slight curves (maximum 3%). If fixed to a solid surface they can even be walked upon. Each panel is individually tested to ensure maximum output, functionality and the long service life associated with Solara solar panels.